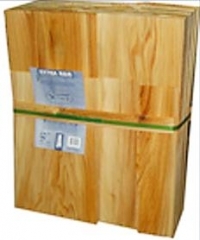 Waska offers all grades of cedar shingles for your building needs. Our latest product is cedar shingles : resquared and rebutted white cedar shingles. cedar shingles edges are squared to eliminate on-site shaving for time-saving installation. cedar shingles are rebutted to ensure a perfect finish for exceptional natural beauty and quality. See your Waska authorized dealer for our latest cedar shingle products. Extra Grade A (Blue Label): no imperfections. Clear Grade B (Red Label): no imperfections up to its clear line. Second Clear Grade C (Black Label): sound knots on exposed sides. Clear White (Brown Label): sapwood shingles, no imperfections up to its clear line. Utility Grade D (Green Label): multipurpose. Note: This guide is as accurate as possible.